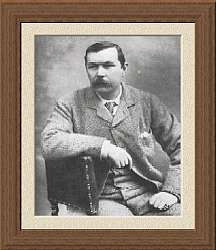 Arthur Ignatius Conan Doyle was "born on May 22, 1859, in Edinburgh. After attending Jesuit schools in England and Austria, Arthur studied medicine at the University of Edinburgh. On graduation, he held a number of jobs, including ship's doctor on a Greenland whaler, before establishing his own medical practice in the Portsmouth suburb of Southsea. Developing his talent for writing as he struggled to make a living as a physician, he created Sherlock Holmes under the influences of Edgar Allan Poe, Emile Gaboriau and his old Edinburgh tutor, Dr. Joe Bell, who brought the same talents of observation and analysis to medical diagnosis as the fictional sleuth would bring to detection. Conan Doyle sold the first Holmes story, A Study in Scarlet, for £25 outright and saw it published in Beeton's Christmas Annual in 1887. His historical novel, Micah Clarke, was published to some success in 1889 and the second Holmes novel, The Sign of Four, first saw print in 1890. The next year he moved to London where, with the publication of The White Company and the appearance of the first Sherlock Holmes short stories in The Strand Magazine, Arthur gave up medicine in favour of writing. In 1912 The Lost World was published, which introduced another enduring Conan Doyle character, the irascible Professor Challenger, who would return in two further novels. He began writing a World War I history even as the battles raged. His The British Campaign in France and Flanders (1920) would eventually grow to six volumes. Long interested in psychic phenomena, Conan Doyle announced in 1916 that he would dedicate the rest of his life to Spiritualism, and launched a campaign to convince the world that the dead actually communicated with the living. Much of his later literary output consisted of essays, letters and books on Spiritualist topics. Though he always felt that Holmes was one of his lesser creations, Conan Doyle continued to write new adventures for the detective almost until his death in 1930. In a rich, active life, Sir Arthur Conan Doyle came to know many prominent people, including George Bernard Shaw, Theodore Roosevelt, Noel Coward and Rudyard Kipling. Late in his life he was described as 'the most prominent living Englishman.' "